We need two points on the efficient frontier to calculate any other point. 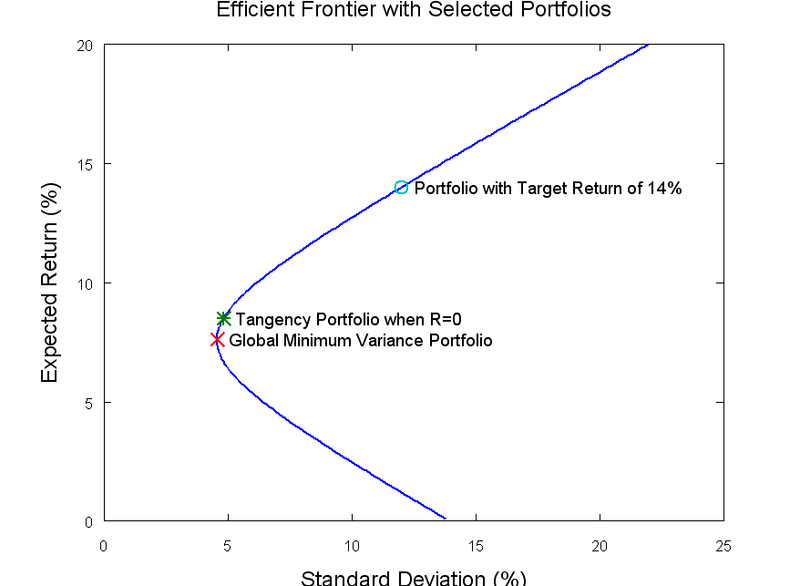 We have the global minimum variance portfolio as a first point, and a second easy point to calculate is the tangency portfolio for the case where the risk-free rate is set to zero. The two fund separation theorem states that all minimum variance portfolios on the efficient frontier are combinations of only two distinct portfolios. So, any two points on the mean variance frontier will span the set. With these values, and the portfolio weights for the two portfolios calculated above, we can find the weights for any point on the efficient frontier. Using these assets, we can use the equations shown above to calculate the portfolio weights for the two reference portfolios, and we can then use these two portfolios to calculate portfolio weights for any point on the efficient frontier. The equations presented above are implemented in an Octave script, and the portfolio weights, standard deviation, and expected return for the Global Minimum Variance Portfolio are shown below. Note that a negative portfolio weight indicates a short position in that security. Note that this standard deviation is the minimum standard deviation for any point on the efficient frontier. The portfolio weights, standard deviation, and expected return for the tangency portfolio when the risk free rate (R) is assumed to be zero are shown here. For this example, we will assume that our target portfolio return is 14%. Using this target return, the target portfolio weights can be calculated. Again, remember that a negative portfolio weight indicates a short position in that security. The script below can be run in Matlab or Octave to calculate, plot, and determine portfolio weights for any point on the efficient frontier. By updating the expected returns (‘zbar’) and covariance matrix (‘S”), the script can be used to compute and plot the efficient frontier for any desired set of assets. It will also calculate the portfolio weights for a point on the efficient frontier with a specified target return (‘mu_tar’). The portfolio weights will be returned in the variable ‘w_s’. The program and formulas will work for any range of data. You can use the decimal values for the means and variances/covariances, and the results will be valid. Indeed there was no scale effect observed, so you are absolutely correct. On the efficient frontier plot, the expected return (y-value) for each stock is determined as 0.000397 * beta_j, while the x-axis volatility or s.d. is simply the s_j for the stock’s 5-year log return. The efficient frontier line (efficient portfolios) is determined by incrementing E(u)=min(u_j) + i*delta, (delta= [max(u_j)-min(u_j)]/100), calculating w* for each increment using the Lagrangians, and then determining u_p and s_p via the matrix-vector and vector-matrix-vector operations on w*. Thus far I can obtain the efficient frontier curve, and there is agreement between the greatest y-value for the curve and the stock with the greatest y=0.000397 * beta_j. However, the x-values of all of the stocks are shifted to the right and the frontier line is to the left. I have observed in the literature that for a CAPM model, the y-value plotted for each stock should be set to the fixed expected excess return you call “u” times the beta_j for each stock. Under this model, the only question becomes: how far back in the matrix algebra do you have to go for the s_j calculations when using the y=E(u)*beta_j approach to get the right values of s_j on the x-axis, that is, so the s_j’s for the frontier line directly overshadow the s_j’s for the set of stocks. There is one final point noticed on most EF plots: both the x- and y-values of the EF curve and the stock with the greatest excess return (on the far right) are always the same. So it begs, the question, when transforming u_j to u_j=E(u)*beta_j, what changes are needed to the matrix algebra above to ensure that at least both the x- and y-value for the max(y) of the EF curve and the x- and y-value for the stock with the greatest u_j are the same? Elegant solution, one question though: How do you deal with the special case when no short selling is allowed? What will the formulas look like then? Thanks in advance. The i,j element of the covariance matrix is the covariance of the ith and jth assets, hence the diagonal is just the variance of each asset. Eh, I’m getting negative weights- what gives? The solution is not restricted to positive weights. It may be that the mean variance optimal portfolio requires shorting some of the assets. These shorted assets will have negative weights.